I was really excited to work with Year 3 pupils from Westgate Lower School on the Stitch a Tree project. Each class in their school is named after a British tree so this was the perfect starting point for us to talk about tree habitats, how they grow, all the ways in which we use trees and some of the mythologies connected with them. The children made drawings and wrote a short piece about their tree. Their responses were all very personal; from trees they loved for their fruit, to trees they had broken limbs falling out of! The teachers had introduced the project before our visit, explaining that their trees would be given to a larger ‘forest’ in support of refugees. They discussed what it might mean to be displaced from home and family. I think this influenced the children as Christmas trees made several appearances for their connection to spending time with family, sharing food and making them think of happy times which they wished for others. This was the first time stitching for many of the 7 and 8 year olds and they relished the chance to try something new. All 60 children were involved so I was very glad to have a team of parents to support us threading needles and helping when anyone got tangled. The children actually needed less guidance than any of us expected and took to the task quickly. I was so impressed with their approach to the challenge of working in a new way and they stitched some beautiful trees. I went back for a second day to work with those pupils who had not completed their tree and although it was not compulsory almost all of the children chose to add more detail or try new stitches. They were rightly proud of their trees and very excited at the thought of being able to come and see them at the Discovery Centre. The wider school community have also got involved and parents have taken kits away to stitch at home with grandparents and siblings. 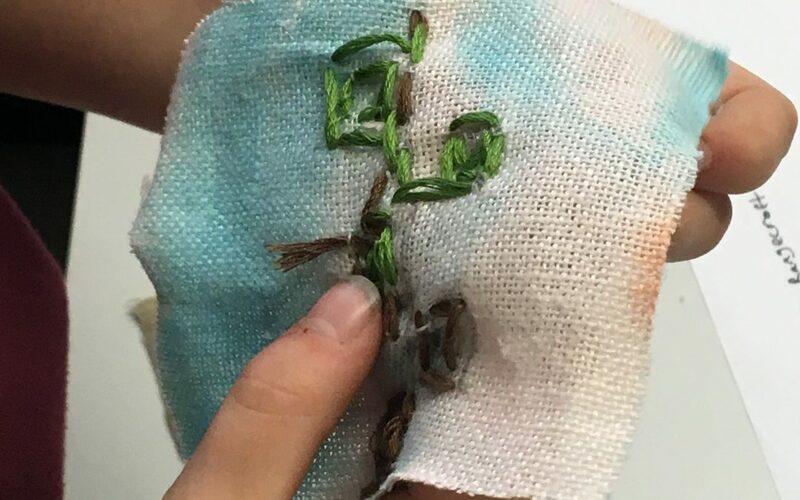 Some of those parents who helped in the classroom enjoyed it so much they took some kits and stitched in Leaf and Bean café to continue the social element of stitching together.